I thought the Walt Disney World 5K would be a great way to kick off my Goofy Challenge weekend. The plan was to run it for fun with Neil and to stop for character photos along the way. Well, Mother Nature decided to throw a wrench in those plans. On Thursday morning we woke up to frigid temperatures and a wind chill advisory. In Calgary at the moment this would feel like a balmy day but in Orlando this felt incredibly cold. Not to mention I probably wouldn’t just stand around for an hour in those temperatures! We were shivering with cold at the race site! The start of the 5K was a bit disorganized. We couldn’t tell how to get to the start line so I asked the runner info booth where to go. She told me we had to go through bag check to get to the start, so even though I wasn’t checking bag, off Neil and I went. We huddled in bag check for protection from the wind before I figured we should hurry our way to the start line. It turns out that the start was on the other side of the staging area from bag check, and to get to the start we had to join a mass of people squeezing through a narrow opening in the barricades where volunteers were checking for bibs. The group was moving so slowly and we were getting close to the start of the race. Finally Neil and I made it to our corral. We ran a couple of warm up laps in our corral and then we were being ushered to the start line. Given the cold temperatures Neil wanted to abandon our plan to stop for character photos as he didn’t want to cool off standing in line. I was torn, I really wanted to run together but this was my best opportunity of the race weekend to get character photos. After the national anthem and the wheel chair start, we were off! Coach Angie had given me permission to run this race fast. She said I was well rested and since I had Friday off before the Goofy Challenge I could run faster with minimal impact to my big race weekend. Since it was so cold it also felt really good to run fast! In fact, I took off so fast that lost Neil in the crowd. I pulled over to the side to wait for him to catch up. We bypassed the first two characters. Flick from A Bug’s Life was hanging out around the one mile mark and Daisy Duck was by Norway. Now that we were running in the park I didn’t notice the wind as much and I felt comfortably dressed. The course was also not crowded at all for us. As we passed Japan I spotted an adorably dressed Chip and Dale. I really wanted to stop but Neil wanted to keep running so we split up. Unfortunately my iPhone photo with Chip and Dale is out of focus and the official photo from MarathonFoto never showed up in my gallery or the lost images. Once I decided to stop for one photo I figured I may as well stop for any other remaining characters on course. I found Marie in France. And Donald Duck just outside Canada. Between characters I ran at a really good clip. It was a good way to shake out some nervous energy. Leaving the park with Spaceship Earth in the background. It was around here that I heard the final corral get sent on their way. Final push to the finish line! As soon as I crossed the finish and got my medal Neil was by my side. He had run a personal best 5K, and was so proud of his race! As for me, I finished in 41:05 on the clock and Garmin says my moving time was 31:48. Not bad! Now it was time to recover and get ready for day 1 of the Goofy Challenge! 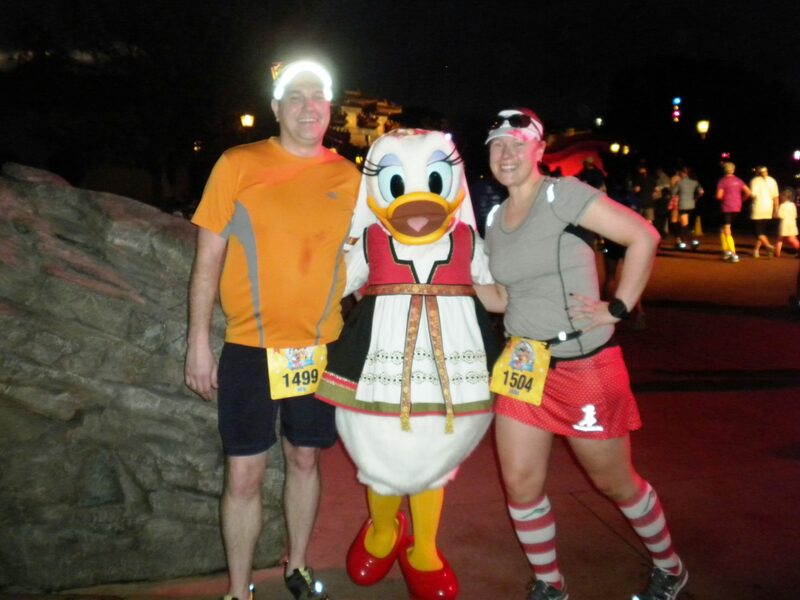 Missed part one of my 2015 Disney Marathon weekend recap? Catch up here! Congrats on another fun race. Love those tights!